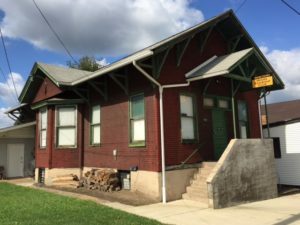 For the second stop in my Exploring Beaver County blog series, I once again hopped on my bike and pedaled my way over the Beaver River, twice, to Monaca (aka, the artist formerly known as Phillipsburg). Of the Beaver County towns I’ve explored thus far, I’m probably most familiar with Monaca. I have several friends who live there, and it’s one of the main routes to the Center Twp. shopping area, as well as Interstate 376. For those of you who aren’t acquainted with this lovely little town, the name is pronounced Muh-na-kuh, not Monica. It’s actually named after Monacatootha, an Oneida warrior chief of the Iroquois Confederacy who met with George Washington during his visit to the region in 1753. I kinda wish they would’ve kept the full name for the town. Tootha would have been a cool name, too. After that I rode down the main drag — Pennsylvania Ave. — and then up 14th Street to the old train station — now a Masonic Lodge — along Pacific Ave. I stopped there for a bit, the kid in me hoping to catch a train speeding past along the CSX line. But, alas, no luck. Monaca’s main street is a mixture of old standards like Yolanda’s and Harper’s Styling Barber Shop, newer places like Sakura, and unfortunately, as with many county towns, empty storefronts. But again, when I look at this town, all I see is potential! The main problem, in my humble opinion, is that the narrow street has a lack of adequate parking. Now, if you’re like me and you don’t mind a little walking, or if you ride a bike, it’s really not that big of a deal. But unfortunately nowadays if people have to walk more than a half a block to go somewhere, they just end up going somewhere else. EVEN THOUGH, people will park in the lot at Walmart (ugh) and then walk an equal OR GREATER distance to the back of the store for a gallon of milk. Don’t get me started. But that’s another post for another day. But I really think Monaca has the potential to be a super-cool “destination town,” much like the Strip District or the South Side in Pittsburgh, both of which also feature narrow streets and limited parking. I’m a firm believer in “If you build it, they will come,” a la “Field of Dreams”. 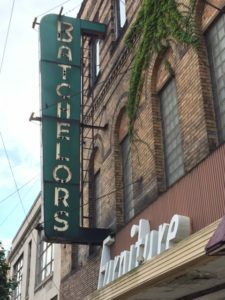 Just in Monaca’s case, the “it” is more trendy restaurants and classy-type taverns, rather than a cornfield baseball park. The town already has a couple friendly neighborhood taverns, a hip coffeeshop, and unique eateries. Sprinkle in a few more, add a dash of vintage clothing shops and maybe a used book shop, and you’ve got yourself one hoppin’ little town. I think Monaca could really be marketed to the younger generation, who are more apt and able to walk, and who want to be centrally located in a vibrant downtown district. And let’s not forget that the Ohio River Trail, when it’s completed, will be passing right through Monaca, bringing hundreds, if not thousands, of cycling enthusiasts into the town. I see places like the Over the Bar Bicycle Cafe in North Park thriving here. At the town’s main intersection, right at the corner of Pennsylvania and 9th, you’ll find P-Dubs Sports Bar and Grille, whose owner did a wonderful job of renovating what was the old run-down Monaca Hotel. Directly across from it is the glassware manufacturer, Anchor Hocking. Many of Beaver County’s towns are fortunate to have these types of small manufacturers right within the town itself (i.e., Eaton Corp. in Beaver, Keystone Profiles in Beaver Falls, and Damascus Steel Casting in New Brighton, etc.). A little further down Pennsylvania Ave., if you turn up 6th Street toward the railroad tracks, you’ll find the Beaver County Model Railroad Club inside a former Pittsburgh and Lake Erie Railroad freight house. Model train lovers will love their impressive layout, which is open to the public beginning on the first weekend in December and extending through the first weekend in January. Next I went around the railroad club and snuck in the back door of the German Lutheran Cemetery. If you didn’t already know, I love cemeteries, and this is one of the coolest ones around. I first visited here a couple years back and it was sadly overgrown. Thankfully much of it has been been trimmed back now, revealing dozens of long-forgotten, faded headstones. Many of the stones are half-buried, crumbling, or have become completely illegible with time. 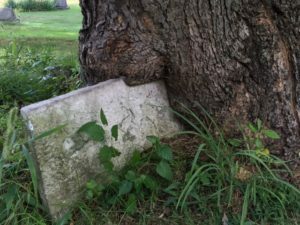 There’s even one in the middle of the cemetery that looks like it’s being swallowed up by hungry tree. The cemetery is also the final resting place of Civil War soldier and esteemed Beaver County artist, Emil Bott. Of course, I couldn’t come to Monaca without stopping by my favorite bridge—the old P&LE Ohio River Railroad Bridge. The Monaca public access boat launch gives you one of the best vantage points of this historic span. After a couple hours of exploring, I was pretty much ravenous, so I pedaled my way over to 3 Guys Eatery (one of those unique eateries I was talking about earlier), ordered a ginormous gyro, and then woofed it down over at Monaca Riverfront Park, which offers one of the best river views in the county (and prime seating during Beaver County BOOM!). The next time you’re in Monaca, instead of just passing through on your way to the highway, the mall, or maybe that other place (ugh), park the car and take a look around. You might just be surprised at what you find. Harper’s Styling Barber Shop — A cool, old-fashioned clip joint. Ball Furniture Outlet & Interior Services — For your inner treasure hunter! 3 Guys Eatery — Excellent American and middle-eastern fare. German Lutheran Cemetery — Photo buffs and historians alike will love it here. 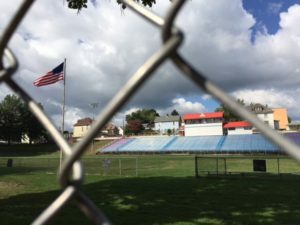 15 Responses to "Exploring Beaver County – Monaca, Pa."
Val: Awesome blog on Monaca we share a common vision for the town, and I am very optimistic we are getting close to seeing it happen. A new upscale Italian Restaurant “Radici” is plan to open in the former Pacentro’s across from the Fountain. 3 Guys has amazing MiddleEastern/Indian cuisine. Their grape leave are the best I have eaten, and their Chicken Curry is really good. My has been to make it the Lawrenceville of Beaver County. We are moving forward aggressively for a new Streetscape in 2018 and with the Shell Development I think Monaca will be one of Beaver County’s dinning and entertainment destinations. Thanks again for showcasing the places of interest in Monaca. Have you visited the Baker/Baldwin cemetery at the other end of Monaca (below the railroad overpass by Metcon)? Thank you for the lovely review of my hometown. I no longer live there, I’m a transplanted Central New Yorker thanks to IBM, but I make it back a few times a year and wander the streets just like you. I miss Monaca, it was a great place to grow up! Thanks, the Ohio River Trail will connect Monaca to the GAP/C&O which generated 73 million dollars from tourism. Great for Beaver County. I make it back every so often and loved growing up there. I grew up on 4th street and my gram lived on Bechtel street. No better place to grow up.I now live in Florida but will always call Monaca home. Great article!! 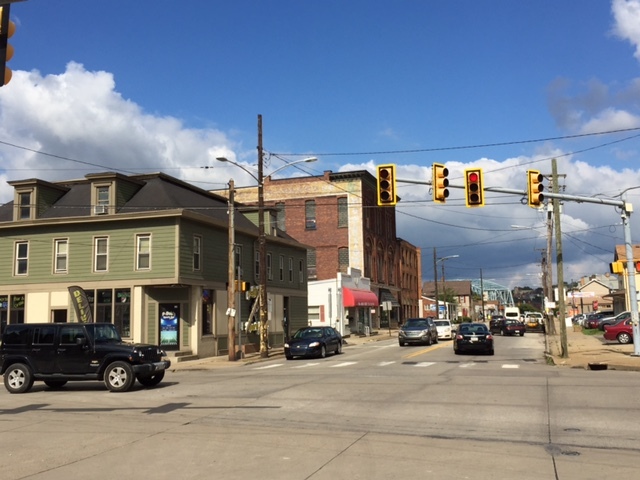 Proud tt call Monaca my home….I agree… Tons of Potential ..widenig main street , somewhat like Beaver, would make a significant difference.. Pursuing grants to make this and other improvements possible could attract more business owners… Monaca has ulimited potential!!! wonderful blog, it is great to have someone make good comments about our town. Now, the next time you should ride up the hill and check out how nice it is! Thanks, Kathy! I like the Heights, too. Great neighborhood! Very nice write up on my hometown Val. Thanx for sharing! Did you know just up from Fourth Street on Atlantic Avenue is the original home of Thiel College? There is an historical marker there too! Thank you! And, yes, I did know that. Cool fact that I don’t think a lot of people know, unfortunately. Thanks for reading!